This month with both the winter & cold weather dragging on (in my neck of the woods) and St Patrick’s Day coming, I thought we can sure use some crystal aids for bringing us more joy & happiness and some good old luck! Are ya with me? Good! Read on to see which are my favorite go-to crystals to get my happy on and when I need some luck on my side. Yellow or golden apatite is best known for its amazing manifestation powers, but for me it’s also just as fabulous for bringing joy. It’s sunny gemmy color makes me feel happy upon looking at it! Yellow is a cheerful color, and if you ever don’t know which crystal to choose for a certain function you can always choose based on the color. Colors are important because they can tell us which stones align with the chakras, but also pretty much everyone knows the feelings that are induced by looking at different colors! And yellow crystals are bound to bring happiness and cheerfulness. Yellow apatite is a stone that brings positive energy into your auric field. It also has solar vibes and strong male energy. This bright and stimulating energy strengthens your willpower and can help you discover what you really want in life. It strengthens your confidence as well. Helps you to become MORE…..of whatever you want more of in your life. Makes you more positive overall and enthusiastic. Very powerful yellow ray crystal. Ocean Jasper is known as the “happiness stone”. They say it’s like valium in crystal form. If you are feeling down or blue, this stone will be your best friend! It encourages feelings of joy and helps you to release negative feelings so you are more optimistic. It aids you in reframing negative experiences into a new positive light. It helps you to communicate positively and helps you to verbally express feelings of love to others. It relieves tensions, stress and worry and makes you more aware of the good things in life. It promotes self-confidence, self-esteem and self-worth. Ocean Jasper has a strong heart based energy and I hope you will try this for yourself next time you need a boost! Citrine is another beautiful yellow color crystal and it is indeed a mood booster and will cheer you up. It’s known as the “merchant’s stone” and should be put in your wallet or in a cash register if you have a store to attract abundance and success to you. It has a strong sun energy and brings light into all areas of your life. Brings joy, happiness and good energy to you. Citrine also transforms negative chi energy into positive beneficial chi energy. Since it doesn’t absorb the negative energy but instead transmutes it, citrine never needs to be cleansed. Wear this bright sunny stone to tap into the beautiful properties. Green Aventurine is best known for its ability to promote growth. Whatever you are wanting to grow or multiply, this is your best tool. I always add green aventurine to my plants. (Just place on the soil or bury). It also can help grow your luck. This is the stone recommended for good luck rituals of any kind. It’s the stone you want if you’re gambling or playing the lottery, as it’s the stone that boosts your chances in any situation and helps align opportunities for you. It’s also what is referred to as the “stone of personal growth” and also aligns opportunities for learning, growing and personal development. Green Aventurine is an optimistic stone and promotes a zest for life. It promotes success and confidence and draws abundance of all kinds to you. It can protect your heart, acting as an emotional anchor of sorts. It can even help you to work through unresolved emotional issues. This stone is such an important one for anyone’s collection. A workhorse for sure. Who doesn’t love pyrite? Its glittery golden sparkles that look like literal gold. It looks rich and expensive, so if you want luck (especially prosperity luck) then it makes perfect sense that this is a great choice. This is a perfect stone in feng-shui for bringing prosperity and abundance into your home or place of work. Pyrite helps to relieve “poverty consciousness” and limited thinking. It increases focus and gives you motivation and self-confidence. It’s a symbol of wealth and success. It’s revered to as “fool’s gold” but if you use this stone a fool you definitely are not! Brings vitality, creativity, protection and instills a warrior attitude. Gives you the ability to pursue your dreams. Dream in gold and dream big and use pyrite as your partner to create your bliss. Jade is known as a lucky charm. It promotes success, wealth and wisdom. It is the best good luck charm for wealth, abundance and prosperity specifically. Green represents growth and vitality (as with aventurine) and not only growing a richer life in respect to material possessions, but a richer experience in all aspects of your life. It’s a wish stone or dream stone. Hold this or wear this stone when you are visualizing your goals and dreams. The stone for dreamers, reach for the stars with this powerful ally at your side and make your thoughts become your reality! Jade is also a well known stone for eternal youth. Using a jade roller for your skin, or making jade water to spritz your skin is a great practice to incorporate into your daily skin care regiment. I hope this gives you some crystals to get started with to tap into happiness and joy. Try out one or more of these stones and see if they make a difference in your life. If you need luck or good mojo get yourself one or all of these good luck stones and start experiencing their magic. All of these crystals work together beautifully and complement each other, so the more the merrier! I invite you to make a happiness or luck grid with these stones, adding quartz to magnify them all! How powerful that would be! Have a very happy and lucky month and I hope you will come back next month to read more! Well its February & we know what that means….love, hearts, chocolates and…..crystals!! Crystals are an amazing tool to use yourself if you are focusing on self love, and great for gifting to loved ones as well. There are crystals for drawing love of all kinds into your life. I feel its important to not get caught up in just relationships & partnerships on Valentine’s day. Not everyone is currently in a relationship, and some are not able to spend the holiday with their partners. None of these people should be left out. Love is for the self first & foremost so lets celebrate that. And if you are blessed enough to have a partner to celebrate with, then share the love by gifting them a love crystal. Read on to find out my top picks for crystals to bring love of all kinds into your life. Morganite is a stone that just oozes love in my opinion. Its gentle, soothing and feels like a warm embrace. This is a stone of divine love in fact and therefore vibrates strongly with a beautiful love energy. This stone is a heart and higher heart (thymus) chakra crystal. Its potent for helping romantic partnerships. It helps you to respect both yourself and others. It enhances patience. Its a great crystal for women as it helps them to see and appreciate both their inner beauty and their strength from within. It also helps to connect with divine feminine energies. Morganite assists in connecting with the angelic realm. This crystal holds the vibration of divine love. It doesn’t get any better than that! Pink Danburite is one of my very favorite crystals. So I may be a bit biased here. Danburite is amazing in so many ways, but pink Danburite has all the properties of Danburite but with a good dose of heart opening added in. Pink Danburite gently, but powerfully, opens the crown chakra and then links and attunes it to the heart chakra. It activates higher consciousness from a heart based perspective. The pink variety of Danburite is a heart chakra and higher heart chakra stone. It increases acceptance of ones self and others. It brings emotional healing and releases fear, grief and anxiety. Brings in the energies of serenity and peace. It resonates with angelic realms and brings harmony from that realm down into your heart….um yes please! This stone helps the heart to resonate with divine love, which also promotes self-love. We can all use more self-love in my opinion. Ruby. Say the word and it makes one think of love. And passion. Ruby is a very powerful love stone that opens and activates the heart chakra. It actually protects the loss of heart energy. It helps us to connect to others and helps us to be more emotionally aware. It dissolves any emotional congestion and balances the emotions. Ruby has an intense energy that stimulates loving emotions and passion. It amplifies energy, drive and success. It helps you see and open yourself up to divine love. It makes you see the true nature of love. Ruby helps you to become a vehicle for divine love to flow through to others. Ruby brings bliss and love. Green apophyllite. I have a real thing for this crystal. When I hold this I immediately feel so comforted and loved. Green apophyllite cleanses and balances the heart chakra. In fact it is said that all one needs to do is be in the presence of this crystal to cleanse and balance your heart. This crystal helps you to connect to mama Gaia. It balances the emotions with gentle, loving energy. Its a very healing stone. It helps you to let go of harbored resentments and heals a jaded hurt heart. It brings clarity to situations and decisions of the heart. Green apophyllite helps you to forgive and to release emotions that no longer serve you. It helps you to reach a meditative state and enhances spiritual growth. It infuses you with spiritual love and light and opens you to beings from the higher realms. Most importantly, this crystal opens your heart to joy and love and enhances your ability to receive all the good things in life; friendship, marriage, children, abundance of all things, and love. Sounds like heaven. Pink/purple Lepidolite is such a workhorse and should be a staple in everyone’s collection in my view. Usually when you think of Lepidolite, you think of an anxiety or stress relieving stone. It contains lithium in it so it is for sure a great stone for this. But for me it is much more than just that. Before we can invite all the things we seek into our lives, we first need to learn how to cope with and treat our discomforts. We must be healthy mentally and spiritually in order to both love our self and to love others. This stone is your new best friend. This stone opens and releases pain and suffering layer by layer. It helps you overcome emotions that keep you from doing what you want in life. Wow….that is the real deal. That cuts right to the chase doesn’t it? Its our fears and limiting beliefs that hold us back from our hopes and dreams. Start releasing it! What are we holding onto it for? Holding onto a fear becomes a self-fulfillling prophecy. We make the very things we fear come true by sending so much energy to them! Crystals are tools, our allies in becoming more happy and complete beings. I truly believe that. My life has been so enriched by working with crystals, meditating and getting in touch with my heart space. Lepidolite helps you find your emotional center. It balances emotions and mood swings. This stone opens up your heart to love and a nurturing vibration. It helps remove the worries and fears. It dissolves energy blocks in all the chakras, making way for happiness and love to dwell. Calm, tranquility and bliss….yes I’ll take that please! Rhodochrosite is a stone that really screams heart to me. Its such a gorgeous shade of pink one can’t help but think of love when gazing upon it. And rightly so, this stone encourages you to reach a state of joy, happiness and love. It aids in emotional healing and encourages you to love yourself. It can stimulate your inner child and promote a childlike joy in your life. It can bring forgotten memories to the surface in order for healing to occur. Rhodochrosite is a powerful heart chakra stone. It vibrates to the energy of love. In this case it focuses on the energy of love directed at the self. Its a very active stone that helps you to heal especially if you suffer from low self-esteem. Self-love is what it’s all about friends. Ahhh rose quartz. Probably the one love stone most people are familiar with above all others. Its easily accessible and inexpensive and therefore the first recommended stone when wanting to draw love into your heart or life. And just because its such a common crystal, that by no means makes it any less powerful or special. Its a perfect stone for someone new to working with crystals and those very experienced alike. Rose quartz is a very high vibration stone. It is a heart chakra and higher heart chakra stone. It’s a stone of unconditional love and infinite peace. It helps you to open your heart so you become receptive to love. It teaches you how to love yourself and encourages self-forgiveness and acceptance. It invokes self-trust and self-worth. Rose quartz is an emotional healer. It draws love to you and supports love in an existing relationship, by restoring harmony and trust. It promotes receptivity to love and beauty of all types. If you need some love, call on Rose quartz. I hope this sparked some interest in working with some of these love crystals. Whatever type of love you want to attract, I’m sure one of these will be more than up to the task. I hope whether you celebrate Valentine’s day or not that you make bringing more love into your life a priority. And if you do celebrate V-day, crystals are the perfect way to spread the love. I was lucky enough to receive a copy of the beautiful book “Practical Magic”, written by Nikki Van De Car and illustrated by Katie Vernon. This book was published by Running Press Philadelphia, in 2017. It’s a beginner’s guide to all things magical. It’s 152 pages long and is a hard back book. 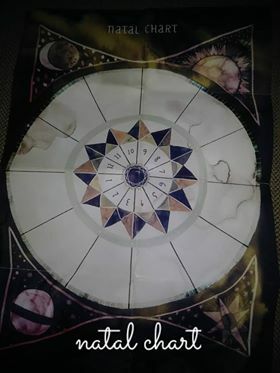 There is an optional kit that accompanies this book, that comes with a mini-book, 2 crystal tumbles, temporary tattoos, and a fold out natal chart. Both the book and kit are available through many retailers, including Amazon and Barnes & Nobles. The book is also available for kindle. I was able to dig into both the book and the awesome kit, so read on to hear my opinions. First off, both the book and kit are so beautiful! I love hardback books, and even more so if they have a gorgeous cover with an appealing title and artwork. The artwork throughout this book is very lovely. This book has 3 parts, (1) Healing for Hedge Witches, (2) Magic for the Weekend Wiccan, and (3) Casual Clairvoyance. There is information on so many topics, here are some (there are many more), auras, palm reading, tarot, crystals, sabbats, horoscopes/astrology, dream interpretation, herbs, chakras, and some recipes and spells too. It’s chock full of subjects I personally am very interested in, and I know most of my friends would be as well. The book is geared toward beginners to magic, but as someone that’s been involved in magic for a long time, I still found the book educational and fun to read. Some topics I’m more familiar with than others, but each chapter I got something out of. I think anyone would enjoy this book very much. Their is a very nice kit that you can get to accompany the book. In the kit you get an adorable mini book, a gemmy rose quartz tumble, a gorgeous tigers eye tumble, metallic & horoscope temporary tattoos and a fold out natal chart you can fill in with your birth info. There are sections in the book that will teach you about both the crystals and how to fill out the natal chart. I love this kit, it ties in with the book perfectly and is such a fun addition! 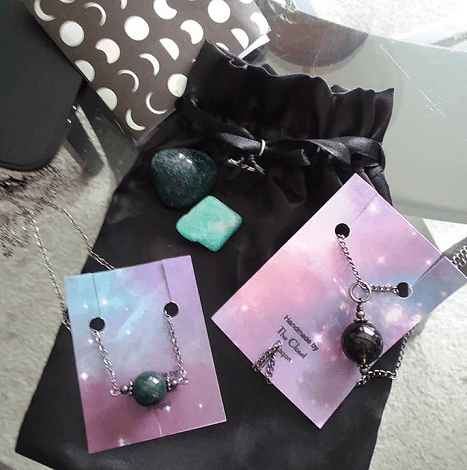 If you know me at all, you know I LOVE crystals, so I was thrilled two beautiful ones were included! Including the natal chart was a great idea and very helpful for those new to astrology. And I’m also a big fan of metallic flash tattoos, so love that this fun element was included. The kit is also a great price for all that’s packed in. I thoroughly enjoyed both this book and the kit. This would make a perfect gift for someone interested in all things magical. Its also available through many sites and at a fair cost. I highly recommend this book and kit! Nikki was so kind… as to answer some questions I had for her. Here are my questions and her responses. Retha: What inspired you to write this book? Nikki: I just love magic. I always have- I was the kid that talked to trees, hoping a dryad would answer. As I got older, I let all of that go, but writing this book gave me the freedom to get close to that feeling again. It gave me permission to be open to that kind of wonder- and that’s what I wanted to share. Retha: What is one thing you hope readers learn from your book? Nikki: I want people to recognize the power of their own will. Over and over again in the book I say ‘magic is about intention’. And so it doesn’t matter how you want to channel your intention, your will, your magic- whether its through chakras or dreams or herbal remedies. What matters is how you live your life in that sense of personal power and possibility. Retha: What made you decide to include a kit to go along with your book? Nikki: This was my publishers idea! Its a fantastic addition, and I just love it. Retha: Who is your target demographic with this book? Nikki: It’s pretty feminine, so for sure women. I’m in my late 30s and I would 10/10 buy this book, so for sure I’m part of that target demographic! But I feel like there’s an insurgency of a younger generation of Wicca-curious millenials, and I hope this book can support them. Retha: How long have you been interested in magical practices? Nikki: After I grew up and got all adulty, I let go of magic for a long time. It was only within the past 5 years or so that I began to reconnect with my love of magic- when I sort of re-met that part of myself, and I found I still really like her! Once I gave myself permission to explore magic again, I started incorporating rituals, spells, herbal healing, and the like into my daily life. Retha: What is your favorite section in the book? Nikki: Personally, I turn to the herbal healing section ALL THE TIME. It’s the most practical. But I loved writing the section on pagan holidays, and those have become a large part of life. I love ritual and holidays, and having explored the meanings of these celebrations, I have found I really wanted to make them a part of my family’s life. Retha: Are you planning on writing more books on magical/metaphysical content? Nikki: Yes! In fact I have 2 more on the way! “Magical Places” is coming out in 2019 and “Wellness Witch” will follow shortly thereafter! “Magical Places” explores the haunted, healing and fairy-occupied places of the world, and “Wellness Witch” expands on some of the healing practices in “Practical Magic” with specific recipes and rituals. I hope you enjoyed both my review and my interview with the lovely Nikki, and hope you will check out her website and book!! A huge thank you to Nikki for answering my questions & sending me her book to review and enjoy!